When I first started writing in my little corner of the internet I had no idea quite where blogging would take me. The thing that has probably been most surprising though is the amazing blogging community that I now find myself part of. As I sat alone in my flat back in those early days (nearly nine years ago) I wasn’t even sure that anyone would read what I wrote, let alone that I would through my blog meet people that became firm (real life) friends and that we’d all come together to do some amazing things. One of the most amazing projects that I’ve been involved in has to be Team Honk. Led by the amazing Annie, Penny and Tanya, Team Honk has gone on to raise thousands and thousands of pounds for Comic Relief. Over the years bloggers have taken part in so many activities to raise money and also raise awareness of what Comic Relief is doing to help and support people in need, both here in the UK and overseas. Next week I will be joining up with some fellow bloggers to visit a Comic Relief funded project in central London, and I’ll be sharing my visit with you here on the blog and also on social media. After years of fundraising I’m really excited to see firsthand how some of that money is spent and meet some of the people it has helped. The fundraising itself has to be one of the most fun parts of being involved with Team Honk. Who would have thought that I’d manage to get the then Mayor of St Albans dressed in a Comic Relief onesie (with her chains of office worn over them!) as part of a Lands End to John O’Groats baton relay. And then two years ago I was part of a Team Honk team at the Comic Relief Danceathon in London. Six hours of non-stop dancing to raise money. It was utterly, utterly exhausting, but so much fun. This year we’re all joining forces once again and tomorrow (Saturday) will see a group of bloggers meeting up in London to walk The Honk Line. A ten mile long circular route around London. 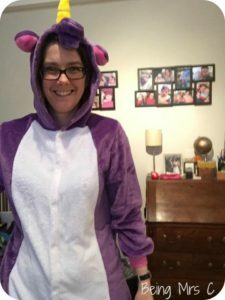 And to fit in with the motto of “doing something funny for money” I’ll be doing it dressed in my new purple unicorn onesie! We plan to make a few strategic stops en-route to re-fuel with lunch and afternoon tea – which will of course be done in style as only a WI member can. I have now realise that this is going to mean wearing this attractive attire not only in public, but also on public transport as I get to London. It’s amazing what I’ll do for charity! So, if you’d like to support me and Team Honk as we walk The Honk Line then you can do so here. Huge thanks to those of you that have already sponsored me, and those that go on to do so. Every penny is appreciated. Keep an eye on the blog next week for news of my visit to a Comic Relief project and make sure you follow me on Twitter, Facebook, Instagram and even Periscope tomorrow to follow me on The Honk Line walk. Keep an eye on the #TheHonkLine and #TeamHonk hostages too to see what the whole group are up to.